We arrived home Friday, and I am finally getting around to the last part of our trip report. 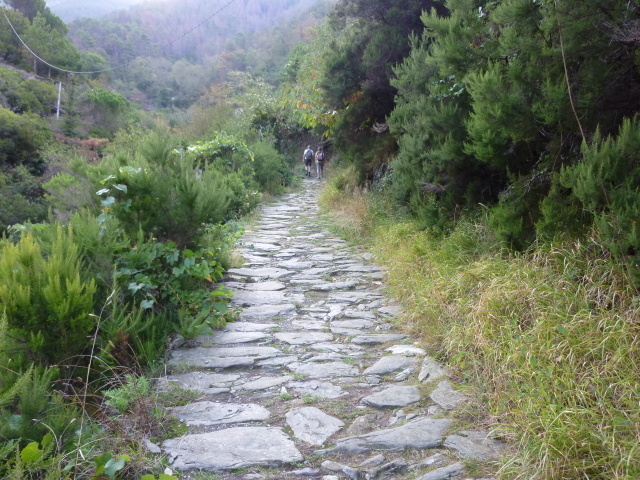 Our last full day, Thursday, we went back to the high trails, this time from Riomaggiore to the Santuario della Madonna di Montenero, one of five religious sanctuaries linked to the five villages. It is possible to hike between all five, although it is a very long hike. 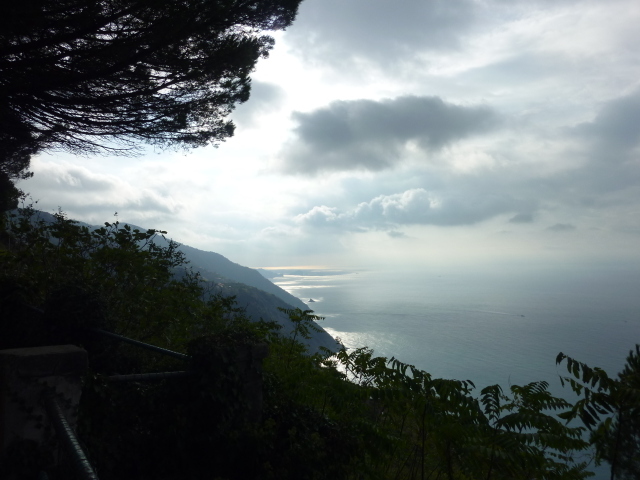 We chose a hike to a magnificent vista that stretched from Monterosso al Mare to the north to Portovenere in the south. Breathtaking! While the day was partly cloudy and rain threatened, it did not start to rain until we were done hiking for the day. Torrential rains in the afternoon must have made the locals fear a repeat of last October’s flood. Luckily, by nightfall it was dry and we enjoyed another fabulous Ligurian meal overlooking the harbor at Manarola. We might have to come back next year…. The way up is far steeper than this looks. Many many stairs created and maintained by volunteers. 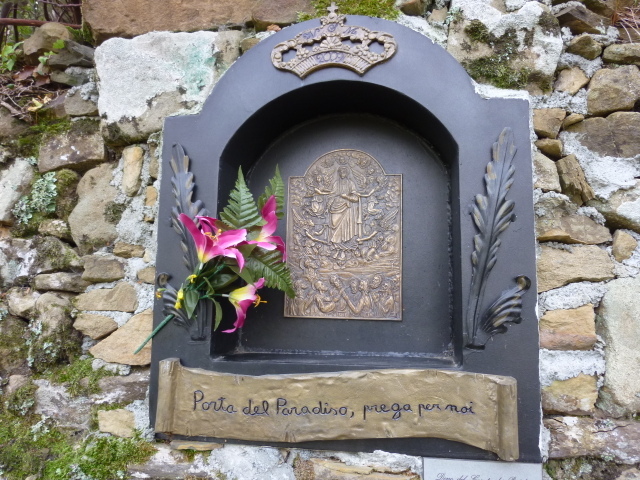 All along the trail, the “Via Grande,” were shrines to the Madonna, donated by various families. 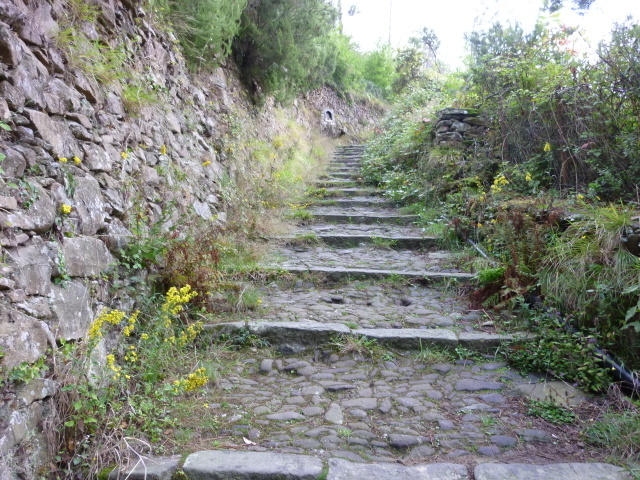 The “Via Grande” is described as “an ancient road.” These footpaths were essential transportation routes for centuries. At the top, a church more than 119 years old. And few people. View from the top looking south, all the way to Portovenere. Worth the climb! The path is “paved” in many places, especially where it might wash out. But it is very rough and footing is tricky on the downhill portion. Sturdy hiking boots are in order. As you can tell, we had a wonderful time in the Cinque Terre. Walking and eating: What’s not to love? There are so many daytrippers who do not have time to explore the National Park. They merely get off the train, spend 37 minutes looking at the souvenir ships in a town, then move on and do the same thing in the next village. I actually overheard a woman telling her husband “We have 37 minutes here. That should be plenty of time.” Seriously? Surely you won’t mind if I link this blog entry? 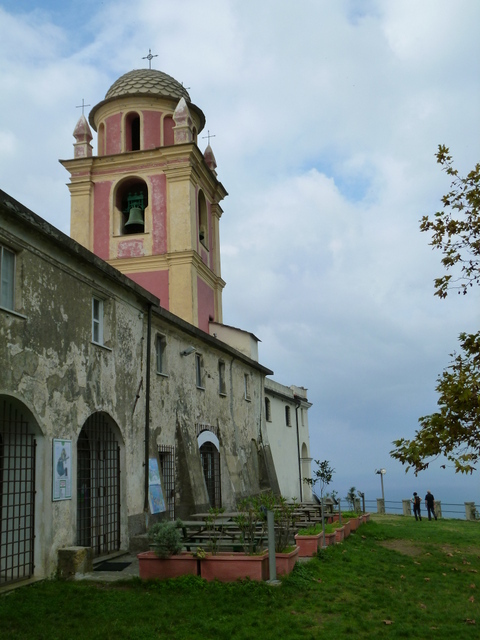 I’m behind on blogging but just now catching up on my Cinque Terre trip in March. Ciao Anita! Maybe you and Scott should come over and take some pics, too. I am really glad to know you are out there reading. Buongiorno Cara! Thanks for the comment. Starting to plan our next trip, probably Venice in December. Without a doubt, your next careers will be very successful travel agents/tour guides. Your trip reports and pictures leave me wanting to get my hiking boots out! You are an inspiration for wanting to see more of our planet. Good rain in Portland on Friday! An inch and a half! It was wonderful. More coming. My dear Carolyn, this IS my retirement job. 🙂 No more careers! But if you come to visit we’ll be YOUR guides. :Love ya’ back!